I’m loving every minute of my family vacation, basking in the downtime and subtly gearing up to face my next major challenge. (More on that next week). To celebrate where I’ve come from and prepare for where I’m headed, I reread my earliest blog posts. Below is a selection from my very first one, written in April 2010. Its messages are relevant for me today, and I thought they just might be for you too. I didn’t start running until after my personal quarter-century mark. I ran for 2 years, off and on. I worked my way up to 3 miles, and I was proud. Then I went to business school. The first 2 weeks I intended to keep working out and I did. The rest of the time I put self-care on a back burner. And so I’ve gone, back and forth, throughout my life, prioritizing exercise, committing to exercise, fearing exercise, avoiding exercise, recommitting, etc. Blah, blah, blah. Throughout this time I’ve had a goal of being able to run 5k again. I figured if I can do this, I am fit. So two years after starting my journey of “I’m more than enough as I am” I decided I wanted to (yes, wanted!) start running again. I did the Couch to 5k program with an iphone app. Best $2.99 I’ve spent in a long time. Ran 3 times per week, for the length of time the iphone told me to. In February I went to buy new running shoes. Saw a flyer for a 5k in Waltham April 3. Thought that sounded far enough away to be safe. Started cautiously telling people I was going to do it so that it would seem real to me. I was delighted when my friend Jenny offered to run with me. Signed up. Kept running. Last week was absolutely exhausting for me. Family drama. Flooding basement. Childcare issues. Sleepless nights. Child rearing concerns. Many people needing me. Me needing sleep. Ran only once during the week. By Saturday morning I truly didn’t know if I could run. My commitment to myself was to try. On the way there my son asked me why I was not planning to win. I tried to explain to him that for me, being able to finish would be a big win. 3.1 miles is a long way for me. As we drove to Waltham, we clocked the distance on the tripmeter. It was 3.2 miles away. Oy – could I really run for that long? As soon as I arrived, got my number and made sure the kids and I went to the bathroom, I felt swept into the action. 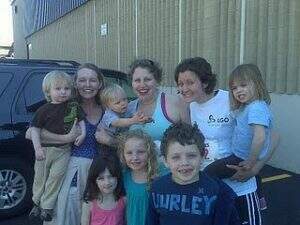 My friend Katherine and her kids came to cheer us on, as did Jenny’s family. Jenny’s husband Chris had the perfect words for me about how supportive the race crowd is. I felt at ease. Chris took this picture of us right before we headed to the start line. When the gun went off, Jenny and I started running. I immediately saw my friend Michelle had arrived with her 2 little ones to cheer for us! The beginning was uphill (I’ve been running all this time on my treadmill at a zero incline) but we made it. Jenny told me stories of her life. We ran. She taught me to read the signs. (We’d been running 4 minutes when we saw the 2 mile sign. Took us a beat to figure out that was for when we’d see that sign from the other direction.) We chatted. When we came to the water station, I gratefully accepted two cups. She told me to “Be like a pro: crumple, throw and go!” I accepted her permission slip, littered, and kept going. When we rounded the bend toward the finish line we saw our kids jumping up and down for us. I yelled “come finish with us!” and the six kids started running along side us. Jenny lifted her Dexter and ran with him (she’s one strong mom). I suddenly had the urge to “kick it in” and sprinted to the finish. When I crossed the line, I saw Michelle. She had tears in her eyes. I said, “I cry when I see athletes run!” She cried when she saw me. I didn’t but her tears brought it home for me. We finished in 39 minutes. Not even last. Two points especially strike me from revisiting my 2010 self: (1) my determination in combination with my willingness to let go and (2) the support I allowed myself to receive. Both were huge life lessons for me, and ones that continue to come back around for me in my spiral of growth. Oh, how I apply these lessons in business too! I ran my second and most recent 5k in 2011. What’s been a major first for you? Re-reading my 2010 post brought me a quick hit of clarity. Would you like me to bring you quick clarity? Email to arrange your private call. In one generous hour, we can skyrocket your immediate productivity! Remember the last line in Camelot when King Arthur says "Run, boy, run"…. for some reason this came into my late afternoon head as I am reading this.. I love to move but hate to run..
Amazing how good friends with big hearts can make you even stronger..
Hope you have a wonderful vacation.. Thank you so much for your beautiful and inspiring message! Still an honor to have run that first with you, Debra! Here's to many more! Ha! Remember when we met, and the first thing we did was go for a run together, outside? I cherish that memory. You ran this 5k not long after that I believe. So true. We met in January and bonded instantly on that “run”. (I thought I was too slow to qualify as a runner. You set me straight!) Just 3 months later I did my first 5k. Thanks for inspiring me all along the way with your athleticism, Stef!.